In Part Three of my collection posts, we move on to the next size up, the so-called vintage silk 70x70cm scarves. This used to be Hermès’ standard size in the 1950ies and onward until the seventies or so, before the larger 90×90 size replaced it. 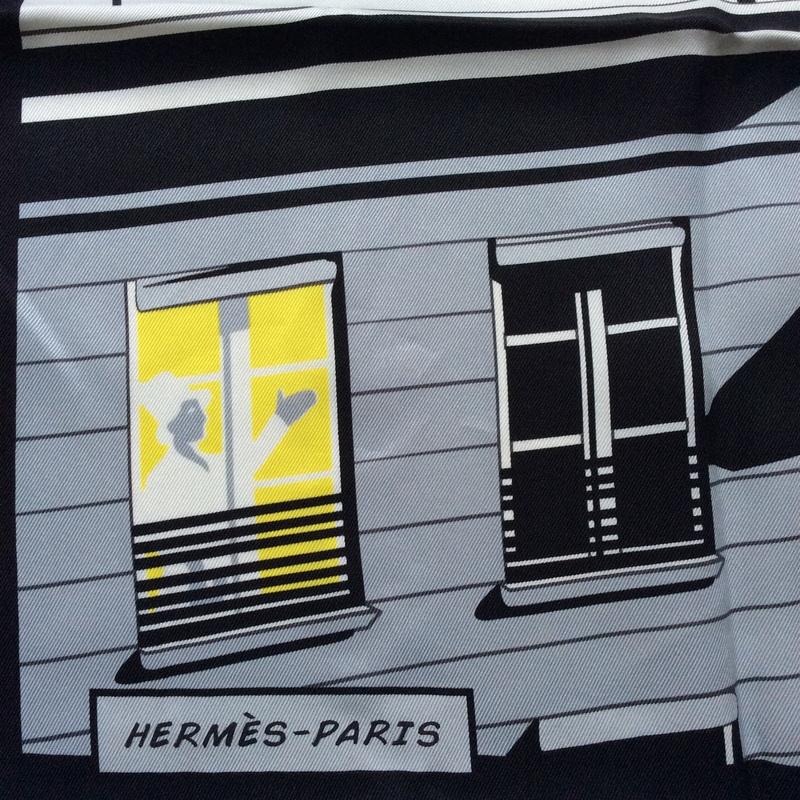 It was re-introduced in 2007 for the 70-year celebration of Hermès silk scarves. Since then a few designs have been released in this size every year. Today I present to you a scarf that I find simply wonderful. Heritage, tradition and a deep commitment history is what characterizes Hermès, but it is not everything. A sense of humour, a willingness to stay contemporary and a certain daring are part of what makes Hermès designs unique. 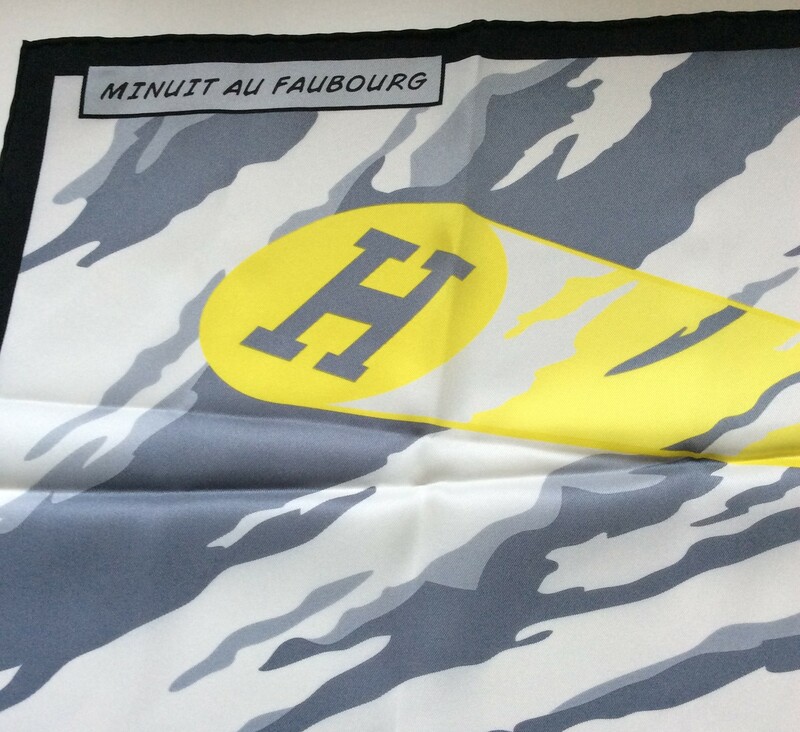 This scarf is called Minuit au Faubourg (Midnight at Faubourg) and is drawn like a comic, even using comic sans font for the title and the signature at the bottom. 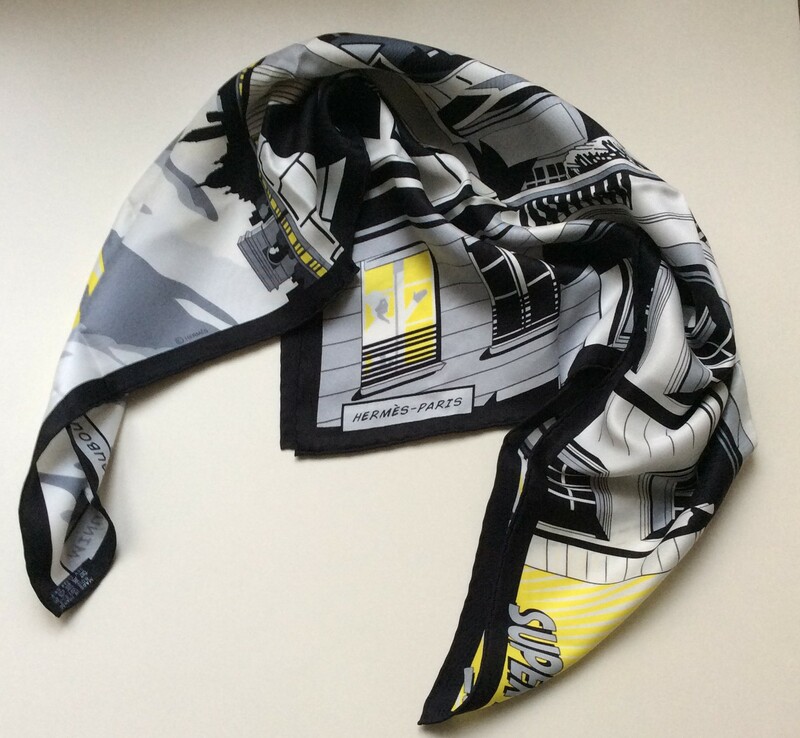 This colourway is my favorite (it was released in about ten different colourways, most of them much louder than mine), it is essentially black and white (or shades of grey) with accents of yellow. This is a scarf I seriously contemplate hanging on the wall, since it really is all about the motif. Above you see it tied. It loses a bit of its punch, but it is still a fabulous, neutral scarf that goes well with just about anything, the yellow giving it a little kick. I couldn’t resist doing lots of detail photos for this one, since there is so much to discover and last but not least, this scarf is pure fun. 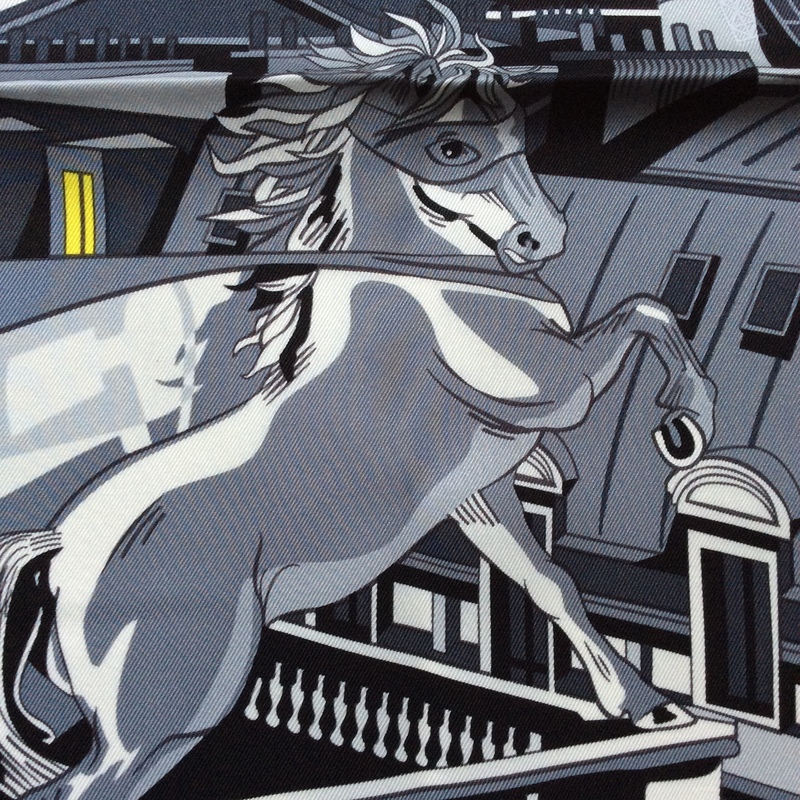 The horse on top of 24 Faubourg is really there on the actual building in Paris (as well as on the Madison Ave, NYC store) and normally bears a rider that is not on his horse in this scarf, but standing in the window. The horse is wearing the cape and eyemask of a superhero. It is being called to save Paris by the light being shone into the night sky from the Eiffel Tower. On the detail below you can see the signature of the artist, Dimitri Rybaltschenko, and maybe the man himself standing in the window? 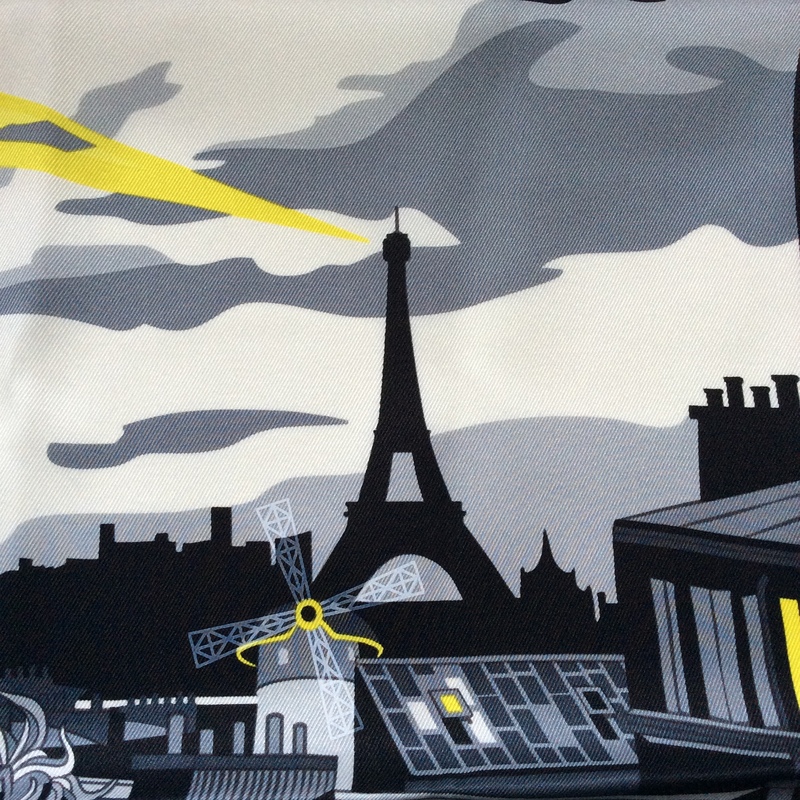 I particularly love the nightscape of Eiffel Tower, Moulin Rouge and several roof tops. I was looking for this colourway for quite some time until it luckily popped up on h.com and I snapped it up. The fun with Hermès is, finding a particular item is always a hunt and you never know what you are getting, when and where (and if at all!!!). As per your wishes, I include a photo of myself wearing the scarf here in a simple knotted loop. The scarf is first folded into a strip and then wound around the neck twice and secured with a double knot. Minuit au Faubourg is surely not a classic design, but I love how it conveys the way Hermès is not a staid, unmoving entity, but a modern brand that doesn’t take itself too seriously. Instead of basking in old glory, they continuously try to stay innovative and thus offer something for everyone. What do yo think about this unusual (for such a venerable brand) design? Do you like it? Or do you think Hermès should stay with bridles and birds? UPDATE: Thanks to commentr happyface, here is a link to a lovely little video about this scarf. 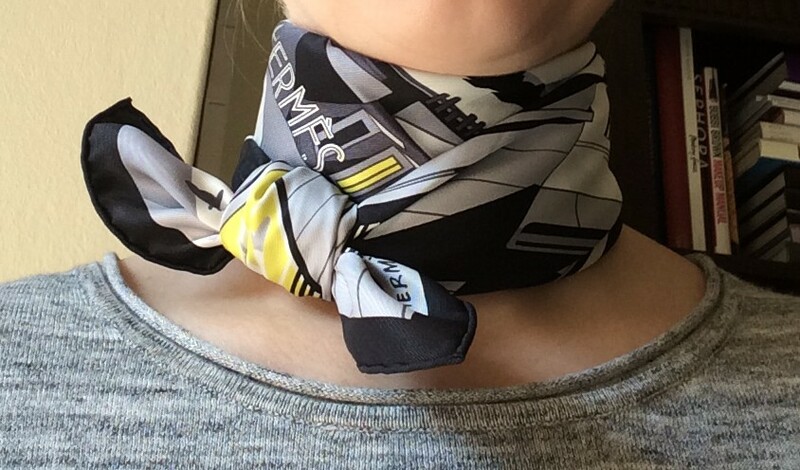 This entry was posted in Hermès, Scarf Collection and tagged Hermès silk scarf, Hermes, scarf collection. Bookmark the permalink. It’s like an easter egg hunt. A great choice, Birgit! Exactly! I love their resistance to being swallowed by the big fish and continuing doing their own thing. Yes, and the big fish keeps playing tricks to get them. I love it! Even if when tied the detail is covered, you as wearer know it’s there and can enjoy it as your own little secret. 🙂 You and Hermes enjoying your own private joke. That is a beautiful thought, Annemarie, thanks for that! Oh, such a beautiful scarf. The colourway is wonderful indeed, but it is the design I like the most. It’s humorous and so detailed. And yes, maybe it’s the nerd in me (I like comics), but if I had a scarf like that (😂), I would hang it on the wall and look at it for hours. Actually, I have a silk scarf hanging on my wall: my son painted it with his grandmother when he was 4 years old:). Aww, how lovely, that is the most precious scarf there is! Hi, I normally just read but must say I love your posts and even more when it involves Hermes! I read somewhere that the man in the window with glasses may be Lanvin designer Alber Elbaz as he stands in the building which houses Lanvin next door. Just like Hermes to have a tongue in cheek detail. Looking forward to more posts! Hello Li Ing, lovely to hear from you! You know what, I think you are totally right about Alber Elbaz, I dimly remember reading about that detail at some point, now that you mention it. Probably not much of a surprise that I love this one. I was lucky to see this one “in the flesh” but now I get to see all the details I missed, such as the brilliant comic sans font and the moulin rouge windmill. This colourway is perfect. I’m glad you waited to find it. You need nerves of steel for the Hermes hunt! The details are so whimsical in this scarf, I love the Moulin Rouge too! Birgit! The magic you add with the story makes everything so much more fun. It’s like being in the Hermes museum with the scarf curator. My joy in each design is more than trebled by you hosting us through them. Thank you. Thank you, dear Portia, for this lovely, lovely comment. So happy you are enjoying the ride with me. I would frame it and hang it on the wall. Portia said exactly what I wanted to say. I feel as if I am getting a private Hermes education in these fun posts! 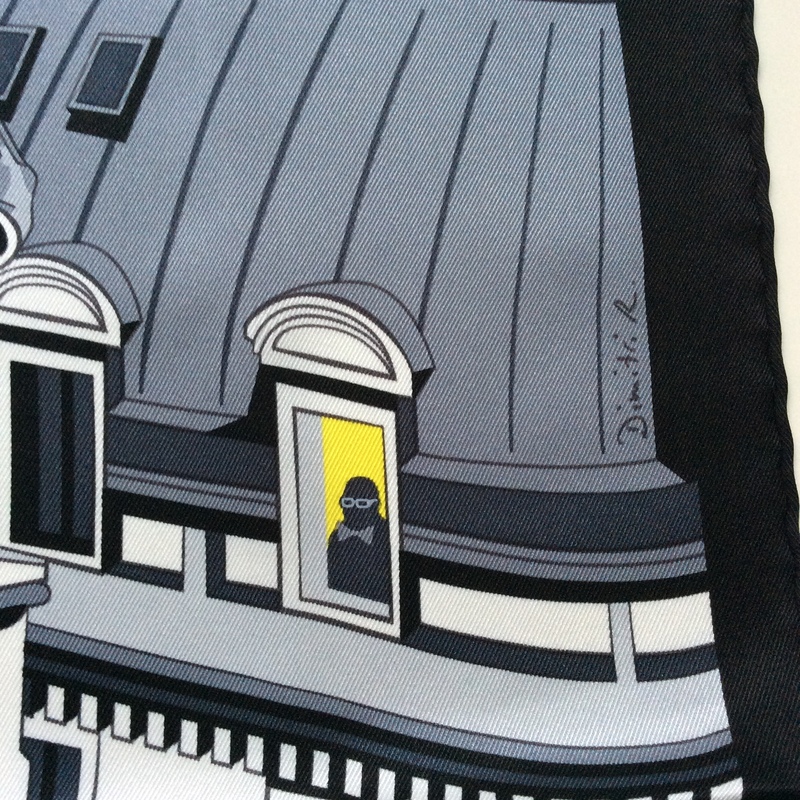 Beautiful design, love the people in the windows and the touches of yellow. Thank you, ringthing, it means a lot to me that you enjoy these posts! That is so beautiful-I have the Shakleton scarf from ten years ago-shades of turquoise, with bits of blue and green and orange. I am tempted to hang it on the wall- it’s so beautiful. I like your posts about scarves and life, as much as I like your perfume posts. Thanks for still writing, and hope the asthma is manageable. you don’t know how much I appreciate that you and many others are with me on this journey in a new direction. Thank you! Love this scarf! I’m surprised you wear it wound up and double knotted. Is there a way to wear it that shows more of the design? If no, then I would definitely frame this one. It’s amazing! Question: what is the best scarf size for a petite who needs less material and likes scarves wrapped tight around the neck? Thank you! As you describe it, I think the 70×70 size shown in this post might be ideal for you. Not too much material, but not too little either to allow a variety of knots. It is hard to say without seeing you in person, but from what you describe I could imagine that anything in the blue family might suit you well (also green, but blue-ish, not grassy). It was exactly my idea too that this colourway lends itself perfectly to the comic theme, rather more so than the other available ones did. I think Li Ing in her comment above solved the mystery and unveiled the man as Alber Elbaz, Lanvin’s chief designer. 🙂 Normally I don’t like yellow that much, but here it give the scarf the extra “kick”. I like the idea of turning the scene into a comic strip. Yes, I think Hermès should stick to making younger designs like this one! I cannot wear yellow either, but this a quite cool shade that somehow works well. to your blog post. 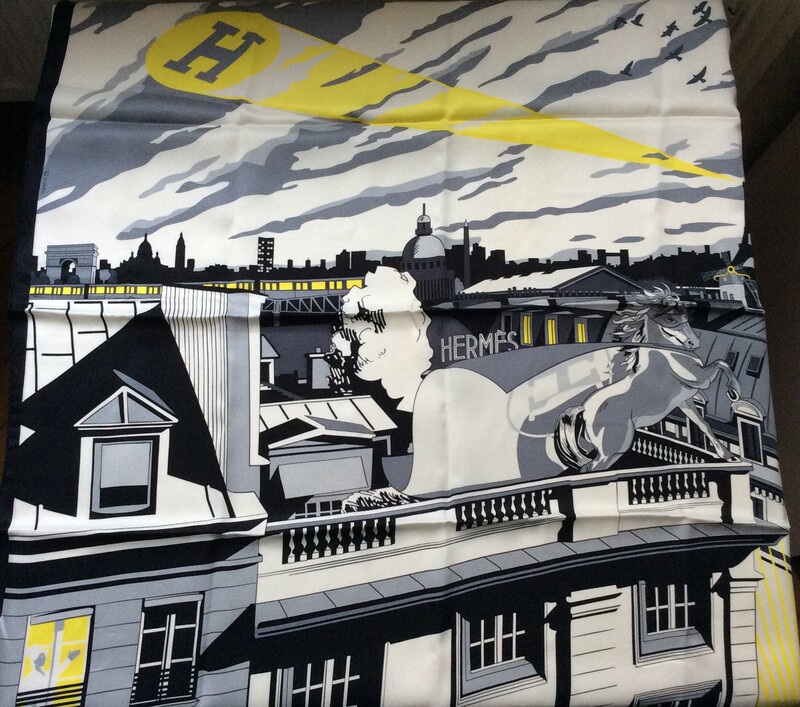 I just found it on the Hermès website – it’s really fun and shows the character of the scarf and the idea behind it. Will add it later (when I’m at my laptop). NOTE TO PORTIA:The shop selling Trouble closed down…I found soooo many gems there in the past.SO SAD. Which ine are you wearing, Farouche? Attelage en Arbalete by Ledoux. I bought it used, but it’s in perfect condition! Oh, there are such beautiful horses in that one. A great classic design.